My parents recently took a trip out west and had a chance to visit with family, see some amazing natural sights, and even the fabulous Cirque Du Soleil O Show. When they returned, my mom asked me to put together an album for her so that she could share her vacation with her church friends the following week! So this is what kept me totally busy this week in my craft room. I’m delivering it tomorrow, so I hope she likes it. Next I dug through my stash of stickers, embellishments, Thickers, and papers to come up with a collection of goodies that I thought coordinated nicely together. I used Me & My Big Ideas (MAMBI) Soft Spoken stickers, Heidi Swapp Memory Planner Puffy Stickers, Prima wood buttons from the Sunrise Sunset collection, My Mind’s Eye layered felt and paper stickers from the Cut & Paste Charm Sweet Bits & Pieces collection, Dollar Tree layered 3D sunflower stickers, American Crafts fabric stickers from the Everyday collection, My Mind’s Eye layered stickers from the Collectable Notable Memo collection, Recollections metal travel ticket, Heidi Swapp clear Word Stickers, various other stickers from old scrapbook kits and unbranded sticker sheets, and old buttons from my button hoard. 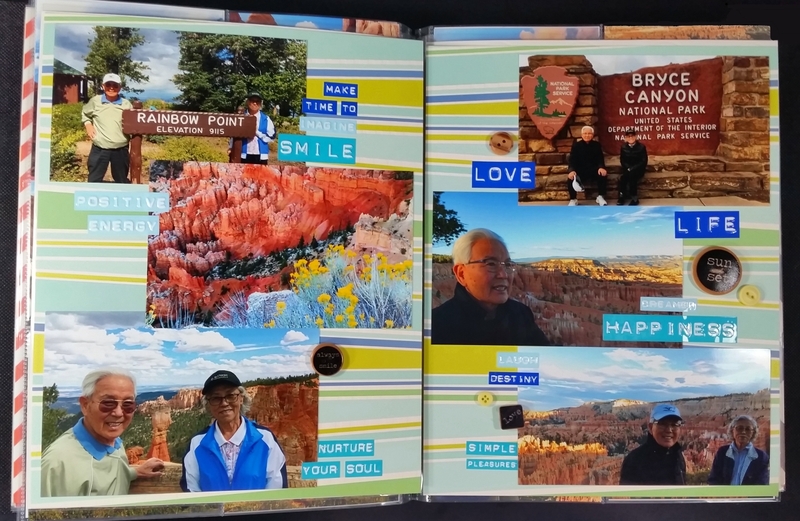 All the papers were from the Travel the World Craft Smith 12″ x 12″ paper pad I had picked up on clearance at Michaels for $5. For added softness I also added some rough twine and metallic gold thread on some of the banners, buttons and tags. 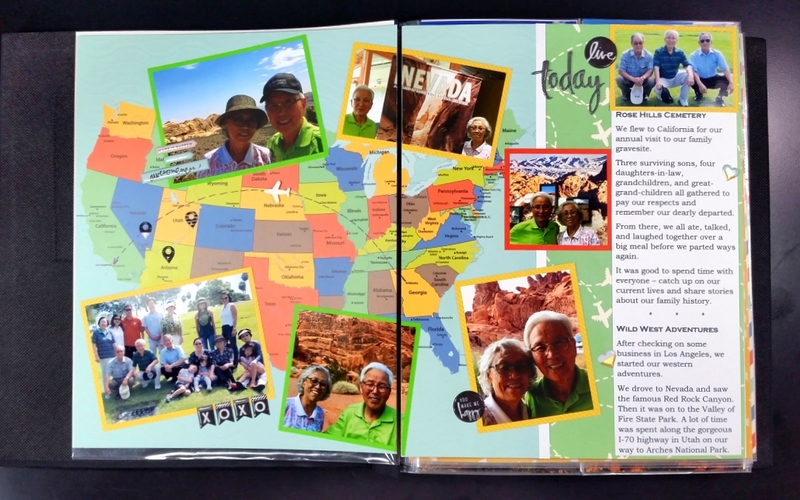 Then it was a matter of putting together each page and double page spread layout for each part of their trip. I did a lot of cropping, more editing, matting, and color coordinating. 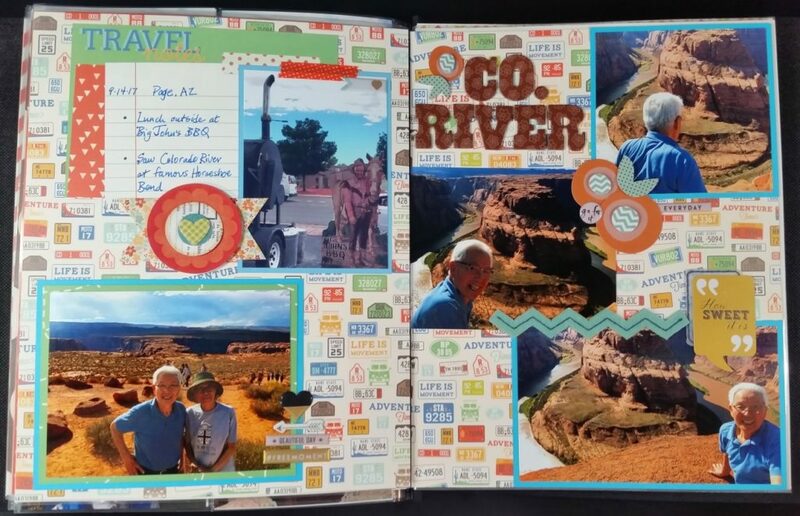 As I worked through each part of their vacation pics, I also tried to note little things about their trip in some hand written or typed journaling. The cut-aparts from the paper pad were great to add little bits of info to a lot of the layouts. This is fabulous. Great layout. Great album! What a sweet thing to do. I have always wanted to do albums for my mom with her shoe boxes full of photos over the years. Thanks for the inspiration. Wonderful album! So many fabulous pics!! Great work! Awww thanks so much Melissa! Awww thansk so much Lynda! Thank you soo much for taking part in our “anything goes with optional leaves” challenge over at Creatalicious & good luck in the draw. Thanks again Melanie! You’re so sweet to do all this work to spread crafty love!